WLL trying to hammer out a bottom around the prior breakout area. Positive RSI divergence and MACD histogram suggesting a possible bottom in the coming days. Looking for the sector as a whole to attempt a bottom this week. 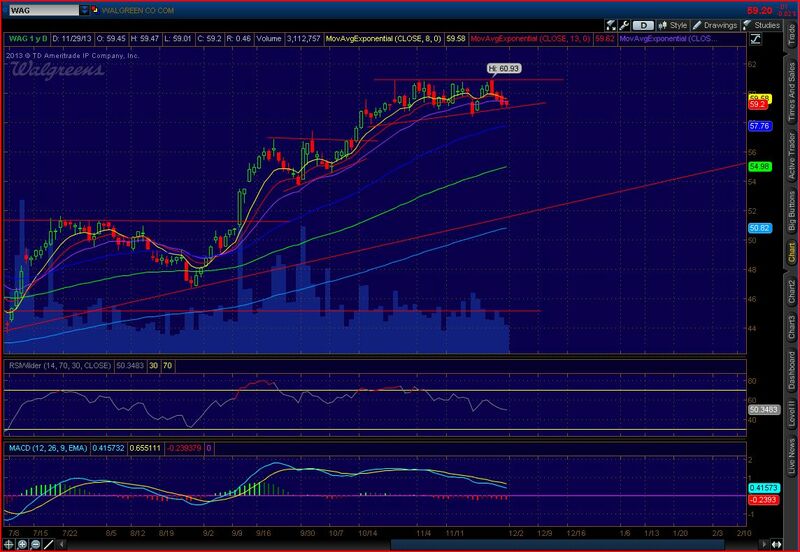 WAG possible rounding top as it closes under its short term EMAs. 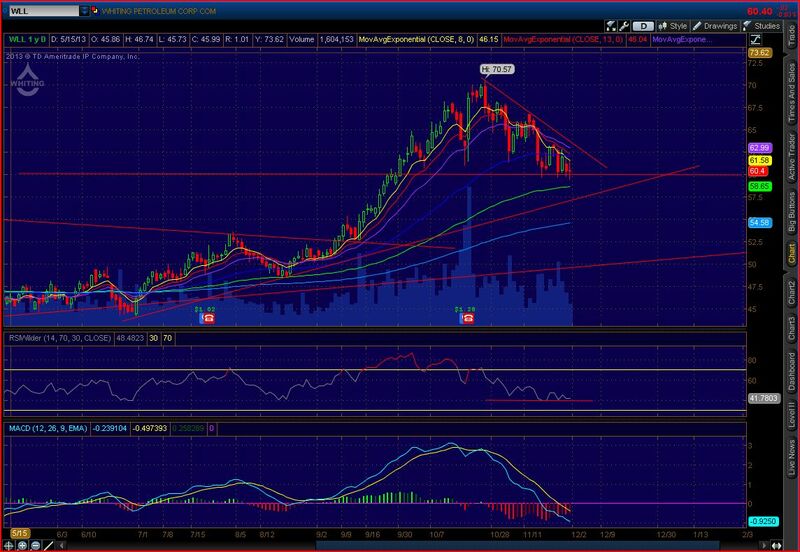 A break below trend line support will trigger a short with a price target of 57.75 at the 50 day EMA. DXY continues to flag after an igniting candle earlier in the month to retake support. Looks good for a long with a stop below this weeks low which coincides with 200 week EMA support. USDJPY breakout continues as it looks to test prior highs. Rising short term EMAs providing immediate support, macro picture looks good here after it worked off its overbought conditions with some sideways action over the past six months. GBPUSD bullish breakout off 8 week EMA support. 1.67 is next major target, looks good on a short term, intermediate and macro term basis. 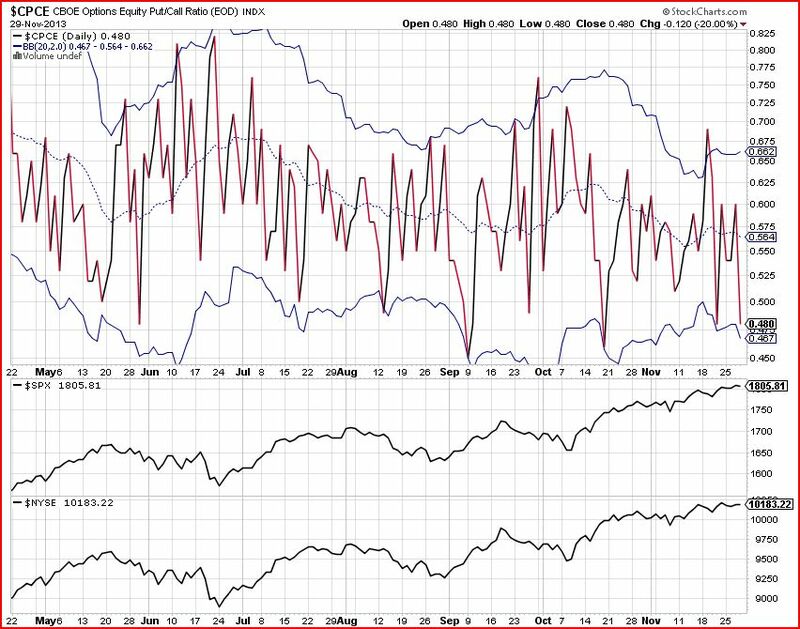 Market breadth has improved as of late and has held its recent gains at or near new highs. The advance decline line as well as the advance decline volume continue to support higher prices after breaking out and holding a higher low. New highs vs new lows held a higher low as well after somewhat of a false breakdown that proved to be of little significance. The put call ratios remain in the lower end of their recent range, with the equity put call ratio hitting the lower extreme last week. This in combination with some distribution into light volume toward the end of the sessions last week could suggest some sort of weakness into early next week. This may be mitigated by the equity fund inflows that we’ll probably see as Monday is the first trading day of the month. The McClellan Oscillator is also showing some choppy action after working off the downside bias we saw as of late, but bulls are going to want to see this resolve to the upside and stay above zero consistently to indicate a strong uptrend. Anyway, as of now market breadth continues to improve and confirm the intermediate term bias to the upside in stocks, despite the relative weakness of some indicators in the short term. Markets traded in an a very tight range today while individual stocks, especially those in the 3-D printing space provided actionable setups for cash flow trades. It may seem all good and well at these higher levels but I’m seeing some concerns regarding this consolidation near the highs. First off, there is notable weakness in small caps, mid caps and tech leaving their charts feeling heavy and vulnerable. Regional banks were week today as well printing a dark cloud cover candle that needs confirmation with downside follow through tomorrow. If you look at the market breadth indicators you’ll also see that many, although confirming prior highs relative to the prior months, are struggling to hold these upper levels as well as price is. We’ve seen some put buying as people seem skeptical at these levels as well, but the VIX continues to crash as we see puts being bought and calls being sold in the front month and December strikes. I’m going to continue to be cautious until we see a breakout to new highs on volume, but as we’ve seen throughout this year picking the right things to be bearish on is becoming increasingly difficult as the macro picture experiences some volatility due to the central planner and congressional shenanigans. SPY continues to consolidate near the highs. Not fully convinced of its ability to break higher, but price pays, remain flexible if we breakout to new highs on volume.